We set up the binoculars on tables overlooking bird feeders, birdbath, trees and shrubs, open prairie, and a large pond. Our conditions were much more satisfactory than the few minutes one usually gets when checking out optics in a store. There were birds and other wildlife aplenty, close and far. 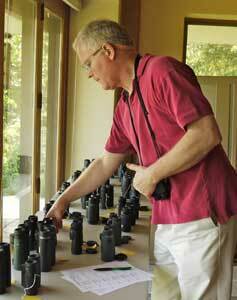 We could take our time picking and comparing among all the binoculars, steadying our elbows on the table and studying the images for a long time. We switched back and forth, comparing one model to another, discussing our impressions, disagreeing, debating, and testing again. To test optical resolution, we set up a stable tripod with a beanbag rest. Across the room we posted a standard USAF-1951 optics resolution chart that let us translate the level of detail we could see into a numeric score for each binocular, and a dollar bill, whose fine detail and high quality printing made it an ideal graphics target. A ceiling-mounted halogen floodlight provided consistent lighting. We mounted a 2x eyepiece doubler behind the binoculars so that we could see the resolution not just at 8 power, but at 16 power. The doubler effectively gave us super eyesight and helped to distinguish fine differences that might be difficult to detect at 8-power magnification. Below the chart we mounted a 4-foot ruler to compare field of view. We tested each binocular many times, over an interval of more than a month, and averaged the scores. To minimize the effects of temporary eye fatigue, we took frequent breaks from testing and always had a reference binocular handy for comparison. 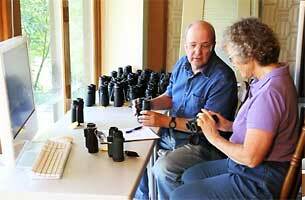 To help us get a wider perspective, we opened up our "laboratory" to local birders for a test day. We gave them access to the same viewing conditions and all the tools we had set up to compare binoculars. Their opinions, comments, and scores are integrated into the chart and individual reviews. Even resolution scores, which we measured carefully, can have a margin of error. The difference between 5.0 and 4.8 may loom large on a chart, but such scores are actually not far apart. In the field, your eyes may not see any difference. Another caution is that we had only a single sample of each binocular to compare, and it might have been atypical. Variation in quality is less likely with expensive optics, as stricter manufacturing tolerances are part of why they cost so much. But you never know. All text is copyright Birdwatching Dot Com unless otherwise specified.